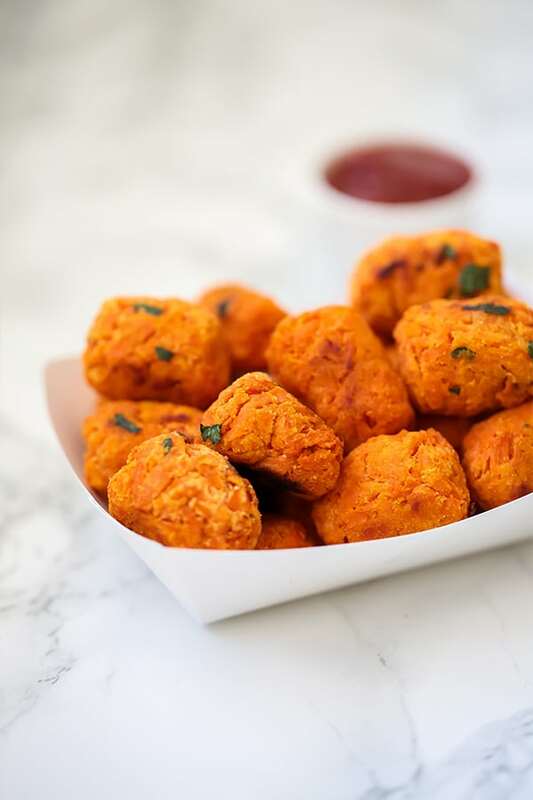 These sweet potato tater tots are oh so nostalgic! They’re paleo, AIP, and super kid-friendly. Tater tots are just one of those foods that everyone loves. How could you not love them?! Whenever I saw them in the school lunch line, or at a ballpark, I knew it was going to be a good day. The problem with them was that they basically had no redeeming qualities when it came to health. They’re basically just blood sugar bombs fried in seed oil. That’s why I knew I had to remake them with veggies and healthy fats! 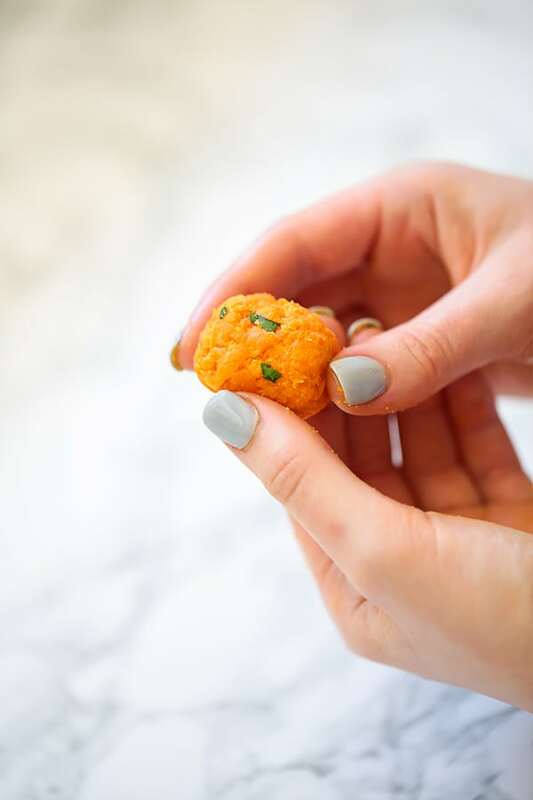 These sweet potato tater tots are made with fresh parsley, healthy avocado oil, and they taste amazing! Honestly, I could probably have these each and every day. Just dip them in a yummy sauce and serve them up next to burger and you’ve got yourself an incredible meal. I used standard orange sweet potatoes for these tots. However, you can likely use other varieties. 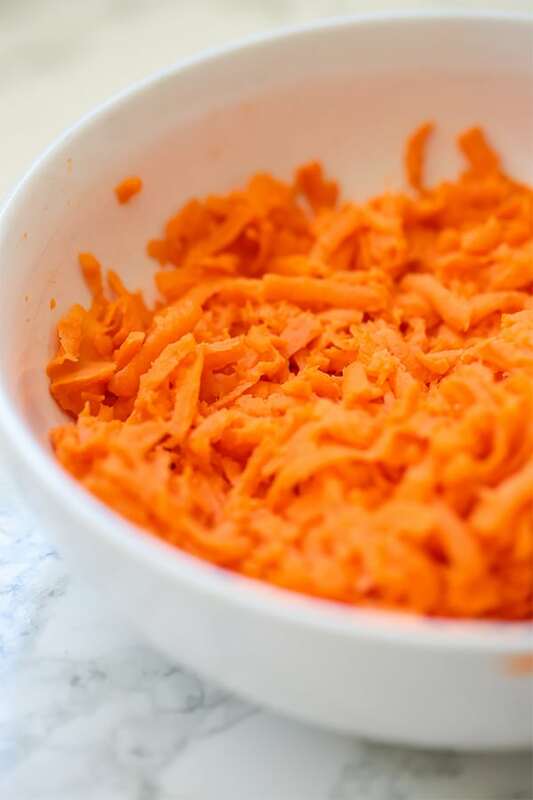 To get the perfect consistency for the tots, you’ll first boil the sweet potatoes and shred them with a cheese grater. This makes it easier to draw out the excess water, and easier to shred! Then, you’ll be able to form them into the perfect little tots. Fun and easy to do with kiddos! Avocado oil has a mild flavor and works well at high heat. Plus, it’s a great healthy fat! This helps make the tots a bit more crispy and absorbs some of the water. You can sub likely cassava flour as well. Fresh herbs are nutrient dense, and add lots of flavor to these tots. Bring a large pot of water to a low boil and add the sweet potatoes, whole. Use a wooden spoon to keep them mostly submerged. Cook for 20 minutes, and remove from water. Set aside and allow to cool. Preheat the oven to 400 F and line a baking sheet with parchment paper while cooling. Use a cheese grater to grate the sweet potatoes. Squeeze out the excess water with a paper towel or cheesecloth. Stir in the coconut flour, parsley, salt, onion, garlic, and 1 tbsp avocado oil with the shredded sweet potato. 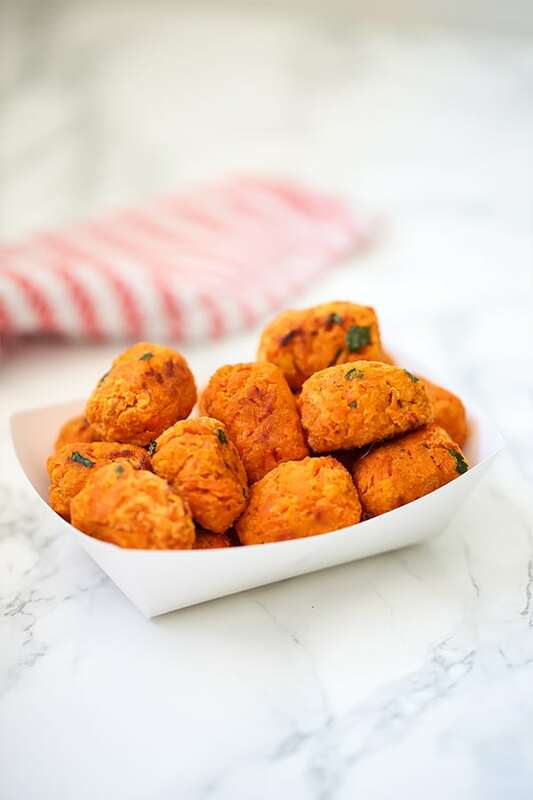 Form the sweet potato into small, 1″ tater tots (you should have around 25) and evenly space them on the baking sheet. Drizzle with 1 tbsp avocado oil. Bake in the oven for 30 minutes, carefully flipping them halfway through. All nutrition facts are estimates. Get free recipes delivered to your inbox! Join thousands of others and subscribe to the newsletter for exclusive recipes, tips, recommendations, and more! Can’t wait to try. Yum! Thank you so much, Jackie!! What is the approximate weight of the 2 medium peeled sweet potatoes? Has anyone tried freezing them for quicker ‘to the table’ time during the week? Would you freeze before or after cooking? I'm Michelle Hoover. I'm a Nutritional Therapy Practitioner, and I live in Dallas, TX. After being diagnosed with Hashimoto's as a teen, I turned to nutritional therapy, a real food Paleo/AIP template, and lifestyle changes to help manage my autoimmune disease and heal my body naturally. Here, I share how to make living a healthy, healing lifestyle fun with real food recipes and lifestyle changes! Many links on Unbound Wellness are affiliate links. If you purchase a product after clicking an affiliate link, I receive a small percentage of the sale, at no extra cost to you. All information on this website and in Unbound Wellness LLC products, meal plans and ebooks are general information. Nothing on the website or any Unbound Wellness LLC content is intended to be a substitute for professional medical advice diagnosis, or treatment. See full disclaimer here. Get my free recipes delivered to your inbox!